Use paper napkin holders on your bar or buffet. They are much needed party table decor for organizing and decorating. Paper napkin holders keep paper cocktail napkins organized during and after your party. Our acrylic paper napkin holders are also coasters. Just insert any cocktail napkin or beverage napkin in the holder and it doubles as a decorative paper napkin holder. 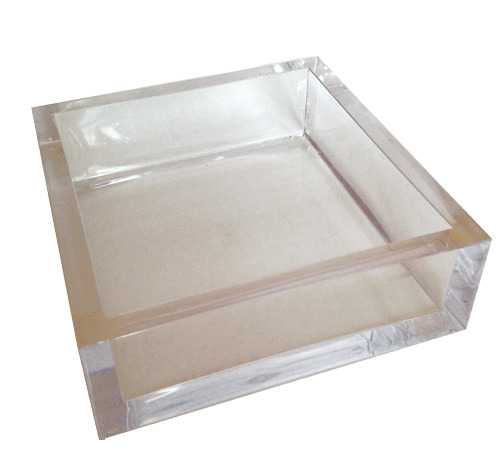 Place a holder in stategic places like on the bar or on the coffee table, or hors d'oeuvre tray. 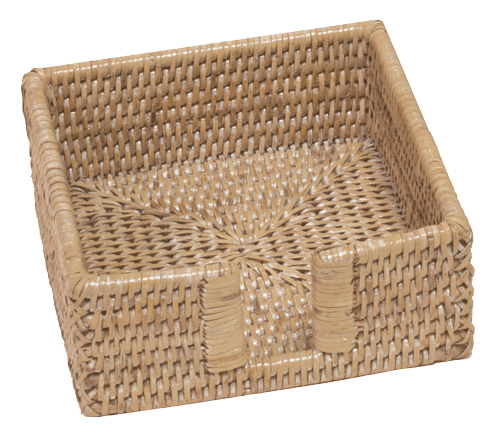 Choose from rattan or acrylic paper napkin holders for cocktail napkins. See our hand towel holder selection too. 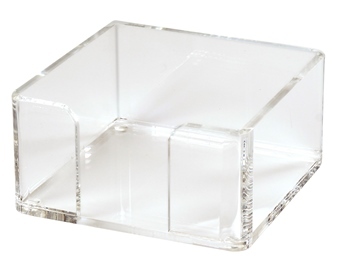 6"x6" Lucite Napkin Holder. 9mm Thickness. Holds 5"x 5" cocktail napkins. 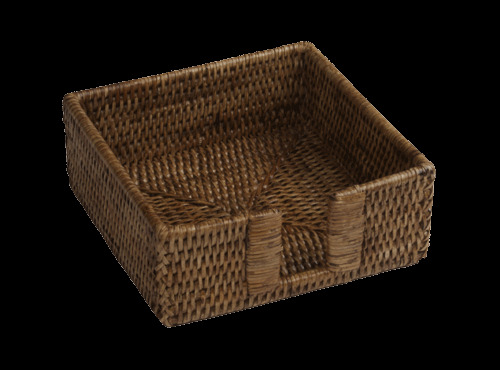 6"x6" Rattan Napkin Holder. Holds 5"x 5" cocktail napkins. 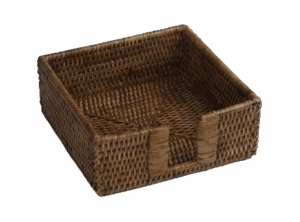 6"x6" White Rattan Napkin Holder. Holds 5"x 5" cocktail napkins. 5" x 5" square, 2.5" tall. Clear plastic paper napkin holder. Paper Napkin Holders All of our pretty cocktail napkins deserve pretty paper napkin holders. When you use a napkin holder, paper napkins become part of your decor. Some people may be more focussed on the drinks, but the surrounding decorative touches play a role in any party. Party table d�cor like paper napkin holders may not be the most obvious party ingredient but that's ok. We think paper napkin holders can be just as key as the wine and cheese. You only have to invest in a paper napkin holder once every few years or maybe not even that often. A paper napkin holder is a decorative detail that may last you a lifetime. When you say "welcome to my party," can I get you a drink and a paper cocktail napkin," say it in style with a good looking paper napkin holder not just a stack of paper beverage napkins. Keep paper napkin holders on your bar or in the liquor cabinet. When the cocktail napkins and the wine are gone, your paper napkin holder will still be there, waiting for the next party occasion.